Asiyah McClain of the Danbury Hatters competes in the 100 meter dash during the Class LL State Track and Field Championship on Wednesday May 30, 2018, at Willow Brook Park in New Britain, Connecticut. NEW BRITAIN — What a thrilling way to conclude what was a triumphant day for the Danbury High School boys and girls track and field teams at the Class LL state championships Wednesday at Willow Brook Park, a rather fitting exclamation point at the end of a memorable day for the Hatters. The Danbury boys won the final track event of the evening, the 4×400 relay, with the team of Phillip Melo, Glenroy Ford, Malcolm Going and Sean-Michael Parkinson finishing in a Class LL-record time of 3:19.38. That put a bow on the Hatters’ matching boys and girls state championships, the boys scoring 841/2points to out-score runner-up Manchester by 191/2points, and the girls scoring 94 points to beat runner-up Glastonbury by 33. The boys’ victory in the 4×400 broke a record of 3:20.64, which was set by Staples in 2011. It was a tremendous team effort for both Danbury teams. For the girls, Moore won the girls 1,600 in a blistering 4:58.22, less than five seconds off the Class LL record, set by the great Hannah DeBalsi of Staples in 2014. Moore came back a short while later and won the 3,200 meters by more than 12 seconds in 11:10.64, meaning no girl ran as far as fast as Moore. The Hatters’ Jaylyn Carter won the 100 hurdles in 15.64 seconds. Danbury’s Celyna Custodio placed second in the shot put with a throw of 39-1, and second in the discus with a throw of 109-7. Shanell Stewart missed the silver medal in the 100 meters by one-hundredth of a second, finishing third in 12.92 seconds. Emilly Souza placed second in the triple jump with a jump of 34-0. For the Hatter boys, Nathaniel Llanos cleared 14-8 to win the pole vault. His victory put Danbury in first place by half a point through 11 events. Parkinson won the boys 200 meters in 22.55 seconds. That win put the Hatters in first place by 10 points through 14 events. Daniel Nichols won a close race in the 3,200 by less than three seconds in 9:07.30. The Danbury boys finished second in the 4×100, with the team of Christopher Cledera, Malachius Lorick, Jaden Cazorla and Parkinson finishing in 42.59 seconds, less than three-tenths of a second behind the winning pace set by East Hartford. The Hatters’ Ford finished second in the 400 in 49.31 seconds, only one-hundredth of a second off the winning pace set by Jevin Frett of Manchester. Going took second in the 800 in 1:55.50, and Cledera placed third in the long jump with a jump of 21-10. Newtown’s Carly Swierbut won the girls 400 meters and set the Class LL state record at 55.42 seconds. The previous mark of 56.00 seconds was set last year by Hamden’s Aisha Gay. Gay placed second this year in 56.47. Swierbut and Gay swapped places in the 200, with Gay winning in 25.09 seconds and Swierbut finishing second in 25.20. Emma Langis of Ridgefield won the 300 intermediate hurdles in 44.99 seconds; the Tigers claimed three of the top four places in the event. Ridgefield’s Gabriella Viggiano placed second in the 1,600 in 5:06.63. Ludlowe’s Maya Mocarski won the 100 meters in 12.57 seconds. Falcons freshman Tess Stapleton jumped 18-13/4to place second in the long jump, just a half-inch short of Southington’s Selina Soule’s winning jump. Ludlowe’s Alyssa Kraus took second in the 800 in 2:17.30, and Paige Davis placed second in the 3,200 in 11:22.66. The Greenwich girls opened the track portion of the afternoon’s events with a victory in the 4×800 relay. The team of Kate Ragone, Hetty McMillan, Zoe Harris and Emily Philippides finished in 9:21.89. Philippides won the 800 in a Class LL-record time of 2:12.71. The previous record of 2:13.47 was set by Trumbull’s Katie Foley in 2014. The Cardinals closed the evening’s festivities with a victory in the 4×400, with the team of Sophia Bastek, Harris, Jordan Numme and Philippides finishing in 3:59.08. The Shelton girls finished second in the 4×100, with the foursome of Haley Oko, Emma Wadeka, Kelly Hurd and Elizabeth Herlihy finishing in 49.97 seconds. The Gaels’ Jacquelyn Simington placed second n the javelin with a throw of 115-4. Trumbull’s Emily Alexandru placed second in the 300 intermediate hurdles in 46.53 seconds, and McMahon’s Taylor Morton took second in the high jump, clearing 5-2. There was nobody better in the hurdles events than Brett Deri of Newtown. Deri won the 110 high hurdles in 15.39 seconds, then came back and won the 300 hurdles in 40.56 seconds. Also for Newtown, Ryan Williams won the discus with a throw of 142-4. Justin Forde of McMahon jumped 22-21/2to win the long jump, while Trumbull’s Jack Jones placed second with a jump of 21-10. Forde also won the triple jump with a jump of 48-33/4. The Staples boys swept the top two places in the 1,600, with Benjamin Seiple winning in 4:21.50 and teammate William Landowne following in 4:24.53. The Staples boys placed second in the 4×800, with the quartet of Tyler Wright, Henry Haas, Luke Lorenz and Christian Myers clocking in at 8:02.30. The Warde boys won the 4×800, with the team of James Maniscalco, Danny Jagoe, Noah Igram and Alexander Mocarski finishing in 8:01.42. Erik Lorent of Shelton finished second in the 100 in 11.08 seconds, and second in the 200 in 22.62 seconds. Oliver Hayes of Ridgefield cleared 14 feet to place second in the pole vault. Reynell Burke of Westhill took second in the javelin with a throw of 165-0. Bridgeport Central’s Rodny Bonhomme placed second in the discus with a throw of 132-10. Fairfield Prep’s Drew Thompson finished second in the 3,200 in 9:09.90. Megan Biscoglio of Southington set the Class LL state record in the girls pole vault, clearing 12-11/2 and finishing in first place. The previous Class LL mark of 12-1 was set in 2014 by Jenna Calandro of Newtown. Allyson Lewis of Norwich Free Academy cleared 5-8 to win the girls high jump and set both the Class LL and the school record. The previous Class LL record of 5-6 was set by Elizabeth Lodge of Manchester last year. 100 Meter Dash Finals: (w: -2.7) 1. Xavier Copening, Enfield, 11.08; 2. Erik Lorent, Shelton, 11.18; 3. Jamar Eaton, East Hartfor, 11.29; 4. Isaiah Brooks, East Hartfor, 11.44; 5. Christopher Pigatt, Hamden, J11.44; 6. Jaylin McGhee, Manchester, 11.47. 200 Meter Dash: 1. Sean-Michael Parkinson, Danbury, 22.55, w:-1.8; 2. Erik Lorent, Shelton, 22.62, w:-1.8; 3. Isaiah Brooks, East Hartfor, 22.72, w:-1.8; 4. Jalin Rivera, New Britain, 22.88, w:-1.8; 5. Christopher Pigatt, Hamden, 23.13, w:-1.8; 6. Akeim Murphy, Brien McMaho, 23.16, w:-0.6. 400 Meter Dash: 1. Jevin Frett, Manchester, 49.30; 2. Glenroy Ford, Danbury, 49.31; 3. Simon Jupp, Ridgefield, 49.97; 4. Liam Killea, Cheshire, 50.16; 5. Andrew Rison, Glastonbury, 50.29; 6. Devin Hall, East Hartfor, 50.72. 800 Meter Run: 1. Joe Pearl, Manchester, 1:52.67; 2. Malcolm Going, Danbury, 1:55.50; 3. Tyler Rubush, Trumbull, 1:55.80; 4. Georgios Karakadas, Greenwich, 1:57.12; 5. Mackinnon Sheldon, Fairfield Pr, 1:57.89; 6. Kevin Arnold, Ridgefield, 1:59.19. 1600 Meter Run: 1. Benjamin Seiple, Staples, 4:21.50; 2. William Landowne, Staples, 4:24.53; 3. Alexander Mocarski, Fairfield Wa, 4:25.82; 4. Robert Dillon, Shelton, 4:27.18; 5. Edward Tristine, Fairfield Pr, 4:29.25; 6. Azaan Dawson, Fairfield Pr, 4:30.42. 3200 Meter Run: 1. Daniel Nichols, Danbury, 9:07.30; 2. Drew Thompson, Fairfield Pr, 9:09.90; 3. William Landowne, Staples, 9:14.34; 4. Brendan Murray, Cheshire, 9:19.85; 5. Benjamin Seiple, Staples, 9:20.61; 6. Robert Dillon, Shelton, 9:24.22. 110 Meter Hurdles: (w: -2.5) 1. Brett Deri, Newtown, 15.39; 2. Osarentin Osagie, Norwich Free, 15.46; 3. Katrell Clay, Norwalk, 15.54; 4. Jonathan Lindsay, New Britain, 15.68; 4. Nathaniel Mensah-Simms, Danbury, 15.68; 6. Chaz Williams, New Britain, 15.74. 300 Meter Hurdles: 1. Brett Deri, Newtown, 40.56; 2. Shawn Akomeah, Manchester, 40.76; 3. Oliver Fulton, Greenwich, 41.12; 4. Devin Wasilefsky, Glastonbury, 41.20; 5. Chaz Williams, New Britain, 41.38; 6. Osarentin Osagie, Norwich Free, 41.96. 4×100 Meter Relay: 1. East Hartford (Jaquan Allen, Isaiah Brooks, Jamar Eaton, Stuart Pike), 42.32; 2. Danbury (Christopher Cledera, Malachius Lorick, Jaden Cazorla, Sean-Michael Parkinson), 42.59; 3. Hamden (Christopher Wallace, Rodney Davis Jr, John Mayes, Christopher Pigatt), 43.10; 4. Shelton (Camerin Gumbs, Michael Rodia, Sean Sirisouk, Nicholas Andrade), 43.32; 5. Norwalk (Katrell Clay, Khalil Eason, Gregory Foster, Malique Stevens), 43.44; 6. Enfield (Kesean Mason, Xavier Copening, Brendan DeBarber, Joel Stewart), 43.55. 4×400 Meter Relay: 1. Danbury (Phillip Melo, Glenroy Ford, Malcolm Going, Sean-Michael Parkinson), 3:19.38#; 2. Manchester (Jevin Frett, Joe Pearl, Willy Joyner, Shawn Akomeah), 3:20.07#; 3. Ridgefield (Aidan Williams, Simon Jupp, Kevin Arnold, Mitchell van der Noll), 3:24.31; 4. East Hartford (Jaquan Allen, Alexander Megquier, Stuart Pike, Devin Hall), 3:26.60; 5. Greenwich (Lucien Ducret, Oliver Fulton, Georgios Karakadas, Zane Robinson-Nye), 3:27.61; 6. Shelton (Camerin Gumbs, Zackary Muller, Josh Sacoto, Matthew Bean), 3:27.75. 4×800 Meter Relay: 1. Fairfield Warde (James Maniscalco, Danny Jagoe, Noah Igram, Alexander Mocarski), 8:01.42; 2. Staples (Tyler Wright, Henry Haas, Luke Lorenz, Christian Myers), 8:02.30; 3. Ridgefield (Ethan MacKenzie, Charles Coffin, Kevin Arnold, Simon Jupp), 8:06.34; 4. Glastonbury (Samuel Wilcox, Matthew Cosentino, Andrew Rison, Ryan Smith), 8:06.97; 5. Manchester (Kyle Smith, Yankarlos Diaz, Andrew Suhie, Joe Pearl), 8:13.79; 6. Danbury (Glenroy Ford, Matthew Burke, Ryan Caldwell, Eric Collado), 8:18.05. High Jump: 1. Chet Ellis, Staples, 6-06; 2. Justin Forde, Brien McMaho, 6-04; 3. Zach Crebbin, Newtown, 6-02; 4. Matthew Santy, Enfield, J6-02; 5. Brenden Sholes, Norwich Free, 6-00; 6. Yazeed Amadou, Manchester, J6-00. Pole Vault: 1. Nathaniel Llanos, Danbury, 14-08; 2. Oliver Hayes, Ridgefield, 14-00; 3. Zachary Burleigh, Southington, 13-06; 4. Christopher Weir, Norwich Free, J13-06; 5. Josh Appel, Westhill, 13-00; 6. Brandon Gottwals, Danbury, J13-00. Long Jump: 1. Justin Forde, Brien McMaho, 22-02.50, w:NWI; 2. Jack Jones, Trumbull, 21-10, w:NWI; 3. Christopher Cledera, Danbury, J21-10, w:NWI; 4. Jahiem Spruill, Norwich Free, 21-04, w:NWI; 5. John Terray, Southington, 21-00, w:NWI; 6. Matthew Santy, Enfield, 20-08.50, w:NWI. Triple Jump: 1. Justin Forde, Brien McMaho, 48-03.75, w:NWI; 2. Abdul Waldo, New Britain, 44-06.50, w:NWI; 3. Jack Jones, Trumbull, 43-00.50, w:NWI; 4. Jahiem Spruill, Norwich Free, 42-03.50, w:NWI; 5. Chet Ellis, Staples, 42-02.50, w:NWI; 6. Matthew Santy, Enfield, 42-00.50, w:NWI. Shot Put: 1. Nathan Quaye, Manchester, 50-07; 2. Adelino Daviega, Norwich Free, 49-01; 3. Ed Radizon, Shelton, 46-01.75; 4. Justin Showstead, Ridgefield, 45-04; 5. Cameron Belton, Norwich Free, 45-00; 6. Andrew Zebarth, Cheshire, 44-00. Discus Throw: 1. Ryan Williams, Newtown, 142-04; 2. Rodny Bonhomme, Bridgeport C, 132-10; 3. Nathan Quaye, Manchester, 131-07; 4. Troy Baxter, East Hartfor, 131-03; 5. Andrew Zebarth, Cheshire, 128-06; 6. Cameron Kelly, Brien McMaho, 126-02. Javelin Throw: 1. Christopher Hebert, Norwich Free, 167-02; 2. Reynell Burke, Westhill, 165-00; 3. Brandon Cua, Staples, 163-10; 4. Justin Showstead, Ridgefield, 162-03; 5. Mason Dumas, Enfield, 156-03; 6. Ryan Williams, Newtown, 153-08. 100 Meter Dash Finals: (w: -1.8) 1. Maya Mocarski, Fairfield Lu, 12.57; 2. Selina Soule, Glastonbury, 12.91; 3. 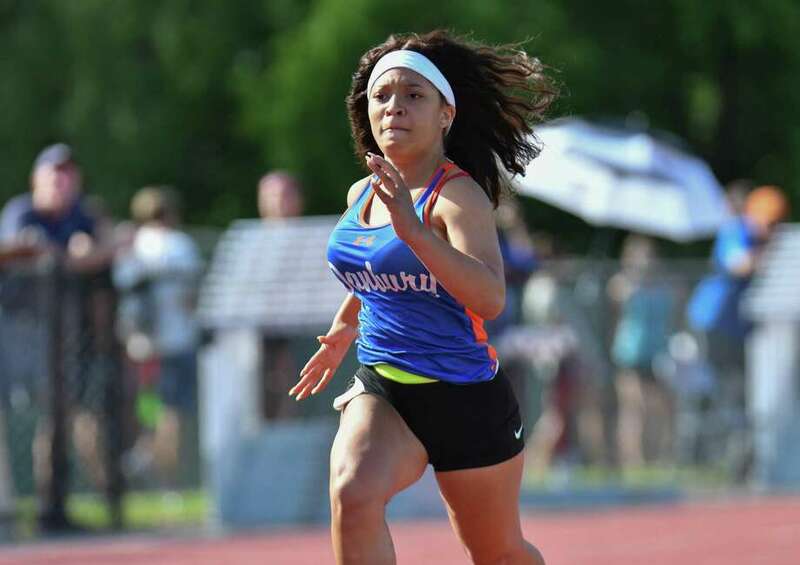 Shanell Stewart, Danbury, 12.92; 4. Yazzmaire Spence, Bridgeport C, 12.98; 5. Andreya Gardner, Hamden, J12.98; 6. Jazmin Bien-Aime, Brien McMaho, 13.00. 200 Meter Dash: 1. Aisha Gay, Hamden, 25.09, w:-0.1; 2. Carly Swierbut, Newtown, 25.20, w:-0.1; 3. Nichele Smith, East Hartfor, 25.89, w:-0.1; 4. Earthaiza Watkins, Stamford, 26.08, w:-0.1; 5. Maya Mocarski, Fairfield Lu, 26.37, w:-1.5; 6. Meilee Kry, Danbury, 26.42, w:-1.5. 400 Meter Dash: 1. Carly Swierbut, Newtown, 55.42#; 2. Aisha Gay, Hamden, 56.47; 3. Laura Turner, Norwalk, 57.96; 4. Jordan Numme, Greenwich, 58.58; 5. Earthaiza Watkins, Stamford, 59.19; 6. Natalie Verderame, Southington, 1:00.63. 800 Meter Run: 1. Emily Philippides, Greenwich, 2:12.71#; 2. Alyssa Kraus, Fairfield Lu, 2:17.30; 3. Erin McGill, Glastonbury, 2:17.62; 4. Leah Sarkisian, Danbury, 2:19.34; 5. Kayla Park, Norwich Free, 2:19.84; 6. Grace Michalowski, Ridgefield, 2:20.82. 1600 Meter Run: 1. Lauren Moore, Danbury, 4:58.22; 2. Gabriella Viggiano, Ridgefield, 5:06.63; 3. Julia Eustace, Fairfield Wa, 5:11.45; 4. Kate Hedlund, Manchester, 5:12.81; 5. Hetty McMillan, Greenwich, 5:13.18; 6. Sydney Nash, Enfield, 5:18.96. 3200 Meter Run: 1. Lauren Moore, Danbury, 11:10.64; 2. Paige Davis, Fairfield Lu, 11:22.66; 3. Alessandra Zaffina, Trumbull, 11:23.36; 4. Caroline Webb, Greenwich, 11:27.99; 5. Alexandra Ross, Glastonbury, 11:47.22; 6. Elysse McCambley, Staples, 11:50.66. 100 Meter Hurdles: (w: -2.2) 1. Jaylyn Carter, Danbury, 15.64; 2. Elizabeth Herlihy, Shelton, 15.74; 3. Kasidy Quiles, Shelton, 16.14; 4. Nora Skoczen, Fairfield Lu, 16.47; 5. Sadeja Angus, Wilbur Cross, 16.48; 6. Mikayla DePina, Trumbull, 16.49. 300 Meter Hurdles: 1. Emma Langis, Ridgefield, 44.99; 2. Emily Alexandru, Trumbull, 46.53; 3. Anna Landler, Ridgefield, 47.55; 4. Carolyn Donovan, Ridgefield, 48.15; 5. Raven-Symone Jarrett, New Britain, 48.53; 6. Sophia Bastek, Greenwich, 48.90. 4×100 Meter Relay: 1. East Hartford (Dayvean McCalla, Nichele Smith, Kelsey Ofori, Kaheira Burgess), 49.37; 2. Shelton (Haley Oko, Emma Wadeka, Kelly Hurd, Elizabeth Herlihy), 49.97; 3. Newtown (Carly Swierbut, Brianna Lovely, Grace Pettinelli, Emma Curtis), 50.03; 4. Danbury (Natalee Seipio, Erika Regus, Jessica Glowacki, Emilly Souza), 50.20; 5. Norwalk (Ashley Wilson, Caila DeGrandi, Christline Edward, Laura Turner), 50.26; 6. Greenwich (Abril Martinez-Arraya, Jada Williams, Olivia DiLascia, Jordan Numme), 50.28. 4×400 Meter Relay: 1. Greenwich (Sophia Bastek, Zoe Harris, Jordan Numme, Emily Philippides), 3:59.08; 2. Hamden (Andreya Gardner, Aisha Gay, Alysia Joseph, Emma Cayward), 4:02.27; 3. Glastonbury (Erin McGill, Alison Guy, Lindsey Anderson, Grace Sparrow), 4:02.91; 4. Danbury (Natalee Seipio, Leah Sarkisian, Olivia Turk, Alexandra Chakar), 4:04.17; 5. Ridgefield (Kasey McGerald, Grace Michalowski, Anna Landler, Carolyn Donovan), 4:06.44; 6. Norwich Free Academy (Allyson Lewis, Kayla Park, Sydney Corl, Emma Ricketts), 4:07.62. 4×800 Meter Relay: 1. Greenwich (Kate Ragone, Hetty McMillan, Zoe Harris, Emily Philippides), 9:21.89; 2. Glastonbury (Alexandra Ross, Grace Sparrow, Kaylen Hughes, Erin McGill), 9:24.00; 3. Fairfield Ludlowe (Lauren O’Neil, Paige Davis, Alyssa Kraus, Madeline Ruggerio), 9:37.75; 4. Manchester (Hannah Sullivan, Jenna Donnelly, Corinne Glenney, Kate Hedlund), 9:38.50; 5. Danbury (Cassandra Sturdevant, Alexandra Chakar, Olivia Turk, Leah Sarkisian), 9:39.07; 6. Hamden (Love’ Melton, Ella Bradford, Molly Marrandino, Tori Raquell Roberts), 9:41.19. High Jump: 1. Allyson Lewis, Norwich Free, 5-08#; 2. Taylor Morton, Brien McMaho, 5-02; 3. Savannah Bromley, Brien McMaho, J5-02; 3. Megan Switzgable, Trumbull, J5-02; 5. Lily Hadin, Norwalk, 5-00; 6. Emitayo Awofala, Glastonbury, 4-10. Pole Vault: 1. Megan Biscoglio, Southington, 12-01.50#; 2. Madison Martin, Norwich Free, 10-06; 3. Lia Zavattaro, Greenwich, J10-06; 4. Paige Martin, Norwich Free, J10-06; 5. Lauren Pawlowski, Shelton, 10-00; 6. Madeleine Watson, Glastonbury, 9-00. Long Jump: 1. Selina Soule, Glastonbury, 18-02.25, w:NWI; 2. Tess Stapleton, Fairfield Lu, 18-01.75, w:NWI; 3. Allyson Lewis, Norwich Free, 17-03.75, w:NWI; 4. Emilly Souza, Danbury, 17-01.50, w:NWI; 5. Erika Regus, Danbury, 16-11.50, w:NWI; 6. Jocelyn Lister, Brien McMaho, 16-08.50, w:NWI. Triple Jump: 1. Rozalynn Smith, New Britain, 34-07, w:NWI; 2. Emilly Souza, Danbury, 34-00, w:NWI; 3. Mallory Malz, Glastonbury, 33-06.75, w:NWI; 4. Jahlyn Lowndes, Wilbur Cross, 33-01.75, w:NWI; 5. Aliyah Lacombe, Norwich Free, 32-09.50, w:NWI; 6. Gloria Twum, Westhill, 32-07, w:NWI. Shot Put: 1. Amanda Howe, Southington, 39-09; 2. Celyna Custodio, Danbury, 39-01; 3. Susie Okoli, Wilbur Cross, 38-09.50; 4. Trinity Cardillo, Southington, 35-08.25; 5. Marley Marston, Newtown, 35-06; 6. Destiny Lewis, Wilbur Cross, 33-05. Discus Throw: 1. Amanda Howe, Southington, 134-07; 2. Celyna Custodio, Danbury, 109-07; 3. Susie Okoli, Wilbur Cross, 109-00; 4. Erin Burns, Newtown, 98-09; 5. Yasmeen Dabiran, Shelton, 97-00; 6. Jaylin Ruffin, Westhill, 94-00. Javelin Throw: 1. Janette Wadolowski, Southington, 117-08; 2. Jacquelyn Simington, Shelton, 115-04; 3. Savannah Buzzeo, Brien McMaho, 114-09; 4. Kaleigh Boyle, Fairfield Lu, 108-06; 5. Mikaela June, Southington, 106-06; 6. Yasmeen Dabiran, Shelton, 104-07.